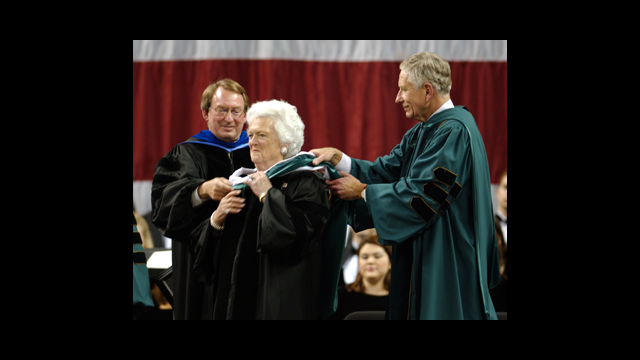 Barbara Bush took part in the traditional hooding ceremony as she received an honorary doctor of humane letters degree from Baylor University. At left is Dr. Donald D. Schmeltekopf, provost and vice president for academic affairs. 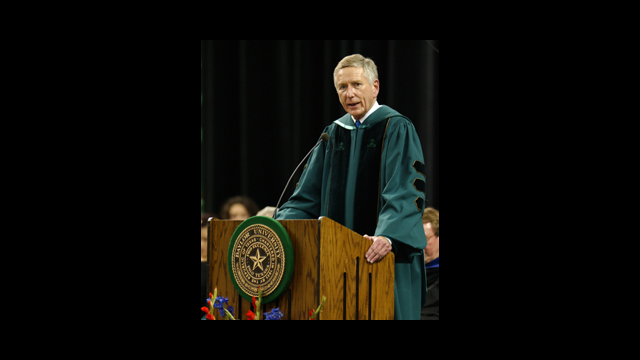 At right is Drayton McLane Jr., vice chair of the Baylor board of regents. 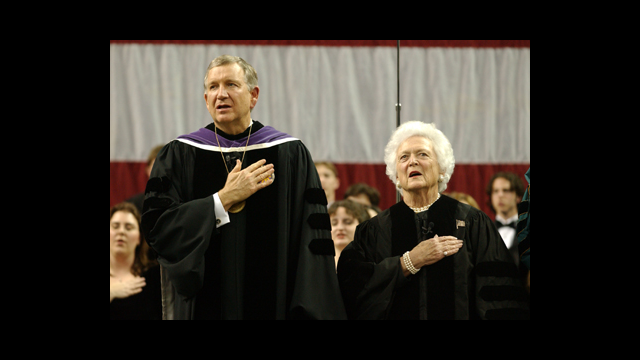 Baylor President Robert B. Sloan Jr. and former First Lady Barbara Bush. 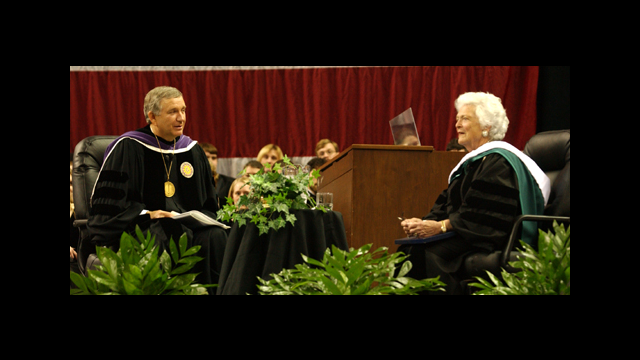 Dr. Donald D. Schmeltekopf presented former First Lady Barbara Bush with an honorary doctor of humane letters degree. Drayton McLane Jr., vice chair of the Baylor board of regents and owner of the Houston Astros, introduces Mrs. Bush at the President's Forum. 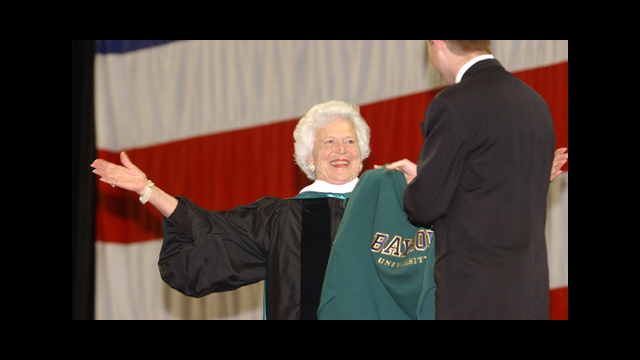 Former First Lady Barbara Bush delivered the President's Forum lecture - "Faith, Family and Friends - My Life After the White House" - March 11 at Baylor University. 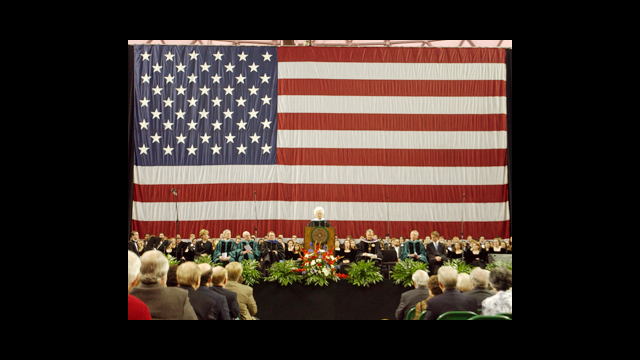 A 30x50-foot American flag provided the backdrop for Mrs. Bush's President's Forum lecture on "Faith, Family and Friends - My Life After the White House" March 11 at Baylor University. Baylor President Robert B. Sloan Jr. moderated a Q&A session with Mrs. Bush, who answered questions submitted by audience members. Baylor Student Body President Matt Flanigan presented Mrs. Bush with a gift of appreciation for her visit - a Baylor sweatshirt. 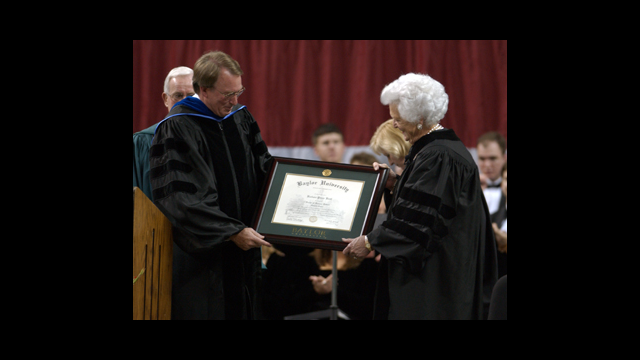 Baylor University President Robert B. Sloan presented Barbara Bush with an honorary doctor of humane letters degree March 11, as the former First Lady visited Baylor as a guest lecturer in the President's Forum Lecture Series. 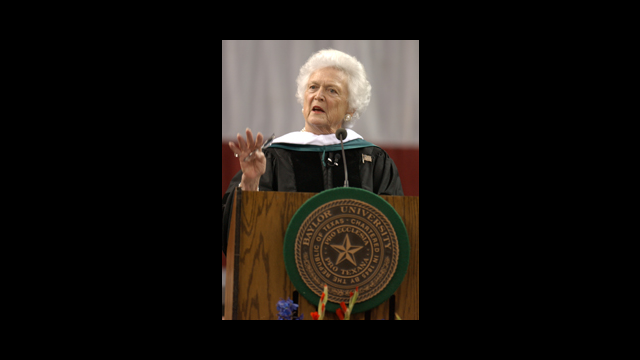 An archived version of Mrs. Bush's lecture, which was webcast live to hundreds of viewers, will be available to view March 13 at http://www.baylortv.com/ .